If you’re like most Americans, then the motivation you had to lose weight starting on January 1 might be waning. At Men’s Vitality Center, we believe that losing weight isn’t just a short-term project — it’s a long-term commitment that requires dedication. 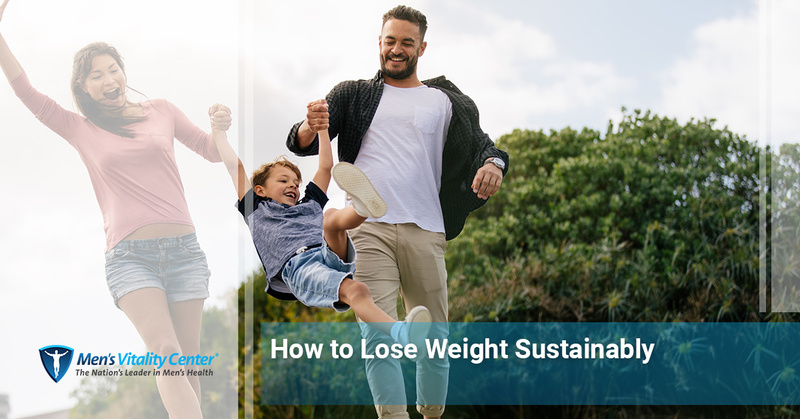 In today’s post, we’ll provide you with a few tips that can help you lose weight in a sustainable way. Our Glendale men’s health clinic offers a variety of services that can help you live a healthier life. From testosterone replacement therapy to weight loss programs for men, we have it all! Get in touch with us to learn more about what we can do for you, and read on to learn how to lose weight sustainably! If a product or diet seems too good to be true, then it probably is. January and February comprise the prime season for diet and fitness product marketing teams, and they’re all eager to sell you products that ultimately won’t help you. Whether you’ve seen advertisements for juice cleanses, fad diet cookbooks, or weight loss supplements, remember that there’s no substitute for hard work and dedication. At the end of the day, you’re much better off investing in a weight loss program or purchasing new clothing that will keep you comfortable as you work out. You know yourself better than anyone else. You know what your temptations are, and you know when you’re close to giving up on a diet. 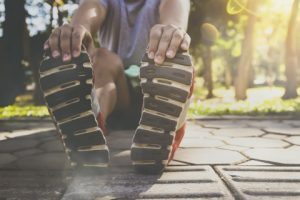 As we mentioned at the outset, weight loss is a long-term commitment, and this means that you need to take action in order to change your habits. Do you typically order food instead of cooking dinner in the evenings? Try preparing food in advance. Is it difficult for you to pass up dessert if you go to a party? Kindly let the host know ahead of time that you would rather not partake. If there’s anything we know about losing weight, it’s that it’s easy to beat yourself up if you’re not getting the results you want. While we completely understand that it’s tempting to be hard on yourself, becoming your own worst critic will only serve to derail your weight loss efforts. Don’t worry if you have a cheat day or miss a day at the gym. In the long run, consistency is much more important than perfection. At Men’s Vitality Center, we know how difficult it can be to lose weight. If you’ve been trying for years to shed unwanted weight, then get in touch with our men’s health clinic to learn more about how we can help. Whether you simply need guidance and structure, or you need to start testosterone replacement therapy in conjunction with our weight loss program, we’ll do everything we can to set you up for success. Fill out the form below or get in touch with our office to schedule an appointment. We look forward to speaking with you!